Welcome to twistedplastic.com my website dedicated to one-sixth scale action figure customizing. I made this site to showcase some of the local events of this hobby and to share the figures from my own collection. 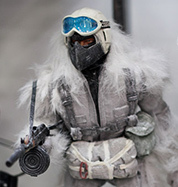 I hope this website will help to inspire others and further grow the hobby and provide a great resource to the one-sixth scale action figure and modelling community. Yes it is! Some of the code was becoming outdating so rather than let the site disappear, why not make some upgrades? Some portions of the website may stop working during the updating process as is the nature of performing the updates but overall a better experience is coming up.